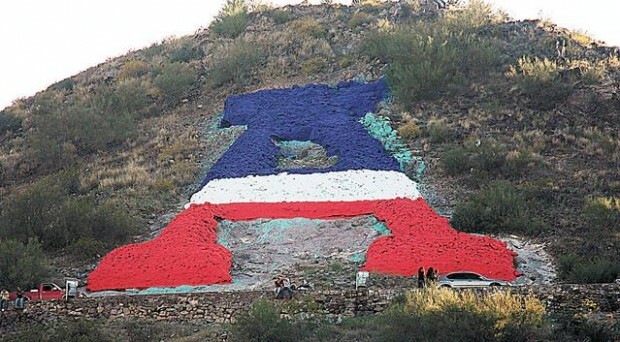 Two businesses took matters into their own hands and repainted the "A" on Sentinel Peak red, white and blue. City officials had said they were looking for someone in the community to repaint the "A" from its St. Patrick's Day green back to its patriotic colors. The city didn't want to foot the $4,000 to $6,000 repainting bill because of budget issues. Tofel Construction provided the labor to repaint the "A" on Friday, while Dunn-Edwards provided the red, white and blue paint. If no community group was found to volunteer labor and paint, some City Council members were advocating the city let it default to its traditional white state that it was before it was painted red, white and blue during the invasion of Iraq in 2003.